An individual may sustain a fatal gunshot wound and yet engage in physical activity.1-2 Experienced forensic pathologists, not uncommonly, encounter cases in which an individual, after incurring a fatal gunshot wound of the heart, is able to walk or run hundreds of yards and engage in strenuous physical activity prior to collapse and death. In one case seen by the author, a young man was shot in the left chest at a range of 3 to 4 ft with a 12-gauge shotgun firing #7 1/2 shot. The pellets literally shredded the heart, yet, this individual was able to run 65 feet prior to collapsing. Such activity is not surprising if one realizes that an individual can function without a heart for a short time. The limiting factor for consciousness is the oxygen supply to the brain. When the oxygen in the brain is consumed, unconsciousness occurs. Experiments have shown that an individual can remain conscious for at least 10 to 15 sec. after complete occlusion of the carotid arteries. Thus, if no blood is pumped to the brain because of a massive gunshot wound of the heart, an individual can remain conscious and function, e.g., run, for at least 10 sec before collapsing. In another case, a 17-year-old boy was shot once in the left back with a .25 ACP (6.35-mm) pistol. The bullet perforated the aorta, left main pulmonary artery, and left lung, embedding itself in the anterior chest wall. When the Emergency Medical Service technicians arrived at the scene, the victim initially refused to go to the hospital with them; he had to be forced into the ambulance. This scene was videotaped and shown on a local television station. He arrived at the hospital approximately 30 min. after having been shot. At the time, he was awake and alert with normal vital signs. Fifteen minutes after arrival at the hospital, (45 min. after being shot), he was noted to be agitated and combative. Over the next half hour he gradually exhibited shock, and 1 hr. and 15 min. after being shot, he was brought into the operating room. At this time, he developed irreversible shock and was pronounced dead 2 hr. and 20 min. after being shot. Sudden blood loss causes interference with activity when it exceeds 20 to 25% of the total blood supply. Loss over 40% is life threatening. The rate of bleeding, the amount of blood loss, the nature of the injury, and the body's physiological response determines the time from injury to incapacitation and death. This can vary from seconds to hours. As blood is lost, there is impaired perfusion of the tissue by blood with resultant cellular dysfunction (shock). The individual becomes anxious, weak, disoriented and restless. The pulse becomes weak, blood pressure falls, and breathing becomes rapid. The body initiates defensive mechanisms to counteract this loss of blood. Blood pressure (and thus tissue perfusion) is directly related to cardiac output and systemic vascular resistance (primarily the vasomotor tone of the blood vessels in the peripheral vascular system). As blood pressure falls, there is activation of the systemic nervous system. Epinephrine (adrenalin) and norepinephrine are released from the adrenals and sympathetic nerve endings. B1 receptors in the heart respond by increasing the heart rate and force of contraction. This results in an increase in cardiac output. Stimulation of A1 receptors in the peripheral vasculature causes selective vasoconstriction reducing the blood flow to the skin, gastrointestinal tract and kidneys, thus maintaining adequate perfusion of the heart and brain. The decease in arterial pressure also causes a decrease in the capillary hydrostatic pressure. As this falls, fluid from the interstitial space is drawn into the vasculature replacing the volume of the lost blood. Once the blood loss exceeds the ability of the body to compensate, there is confusion, disorientation and loss of consciousness. Just as in the case of gunshot wounds of the heart or major blood vessels, individuals can perform tasks or even survive gunshot wounds of the brain, especially if the injury involves only the frontal lobes. Numerous individuals have survived perforating gunshot wounds of the frontal lobes though there may be associated personality changes and/or blindness. In documented cases of suicide, individuals have fired a bullet through the frontal lobes, to be followed by a second, fatal gunshot wound, of the basal ganglia. If a bullet passes through the basal ganglia, one can ordinarily be certain of immediate unconsciousness and inability to move. The only exceptions to this rule that the author has encountered involved two cases of gunshot wounds of the anterior tips of the caudate nuclei. In one case, an elderly individual shot himself in the temple with a .32-caliber revolver. The bullet perforated both cerebral hemispheres injuring the tips of the caudate lobes. Following this, he was conscious for at least two hours during which time he spoke to his wife, a visiting nurse, and EMS personnel. 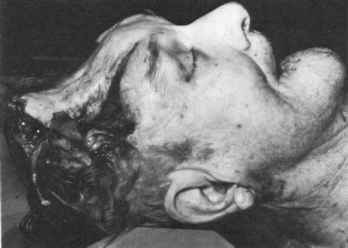 Gunshot wounds of the brainstem produce instant incapacitation, though death may not occur immediately. One individual who had a gunshot wound of the pons survived approximately one week, although in a totally vegetative state. Figure 9.1 Contact wound of right temple with .357 Magnum. The deceased lived 1 hr and 34 min without any life-support systems. Magnum. In spite of the obvious devastating nature of the wound, he lived 1 hr. and 34 min. without any life-support systems. In addition to a wound not immediately causing incapacitation, in some instances individuals who have been shot do not initially realize it. This is not uncommon in combat situations, where the noise, violence, and activity so distract an individual that he may not realize that he has been wounded.